A few weeks ago my husband and I headed to Costa Rica for the first time to enjoy a week long vacation. 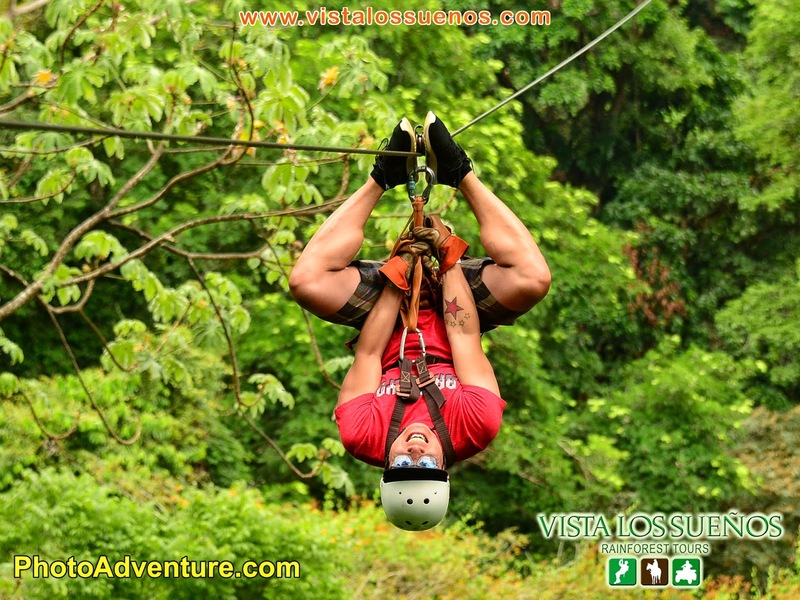 I found a great boutique hotel and figured I would do a quick recap of our stay as well as the activities we did in case any of you are interested in visiting Costa Rica. Our vacation to Grand Cayman last year was tropical and beachy, while this year's trip was a bit more adventurous and exotic. While staying in large chain hotels such as the Westin like we did last year in Grand Cayman can provide its own atmosphere of luxury and comfort, finding a boutique hotel that offers charm and a more unique experience is something my husband and I love. 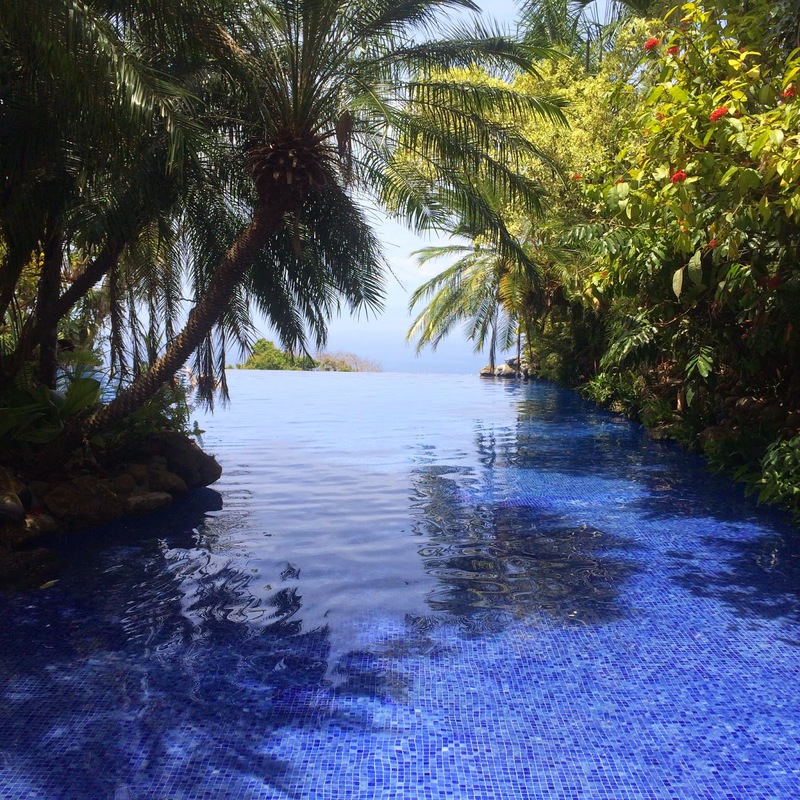 For this trip, I stumbled upon Villa Caletas during my online search and felt it was so perfect for our trip! Villa Caletas is located near the town of Jaco, and is truly like staying in the jungle. The grounds are exotic and because the resort is perched atop a hill, the views are absolutely magnificent. We reserved one of the junior suites which was nestled deep in the property and overlooked the hills and ocean. Here is a video I took of our view from the room. Walking around the property was hysterical because it truly felt like we were in the jungle complete with critters and animals running everywhere. I have seen enough geckos and enormous bugs (like the size of my hand - yowza) to last me a lifetime. Lol. But to be honest, it made the experience so unique and authentic so it was actually more exciting than bothersome. Because the resort is so far up from the main roads (seriously - it takes a good 5-10 minutes just to drive up to main buildings), all activities we wanted to do took place off the grounds which the hotel gladly set up for us. Below are some pictures of the grounds, steps/walkways to our room, the pool and amphitheatre. One of the most breathtaking parts of the resort was the infinity pool which was at the edge of a cliff and overlooked the ocean. I could have sat there every day all day - it was magnificent. What sealed the deal for me when deciding to book this hotel was the amphitheatre. They had built a an amphitheatre (shown above in the photos) where you could sit every evening and watch the sunset. It was one of the most magical experiences sitting there every night watching sunsets that almost brought tears to my eyes - I will never forget that for as long as I live. During our trip, we were active almost the entire time and the resort helped us plan out a few fun activities for each day. I've listed later in the post all the places we visited and activities we did which I would highly recommend trying if you visit. In regards to food and eating during the trip, many of the activities provided food and/or snacks, so we had the evening to explore different places. Since many of the activities wiped us out, the resort recommended some great places that delivered since my husband and I prefer more local places rather than always eating resort food. For one of the nights, we traveled into the town of Jaco where they have a lively and bustling strip of restaurants and bars - I highly recommend walking around for the evening and popping into any restaurant that strikes your fancy. Tortuga Island Day Cruise (the above pic was taken as the sun was setting while sailing away from Tortuga Island) - It's definitely a long day, but the trip out to Tortuga Island was so memorable. The marina is about 1+ hours away from the resort with another hour boat ride out to the island. Thankfully it goes by very quickly and the boat ride is relaxing and beautiful. Once we got there, they have a ton of activities to choose from including snorkeling and banana boating and provide a full lunch for you. It's definitely a long day so be prepared to just go back to the room and crash after because it will wipe you out. Vista Los Suenos Horseback Riding and Waterfalls Tour - This is the activity I was most excited to do, yet was completely unprepared for how exhausting it would be. 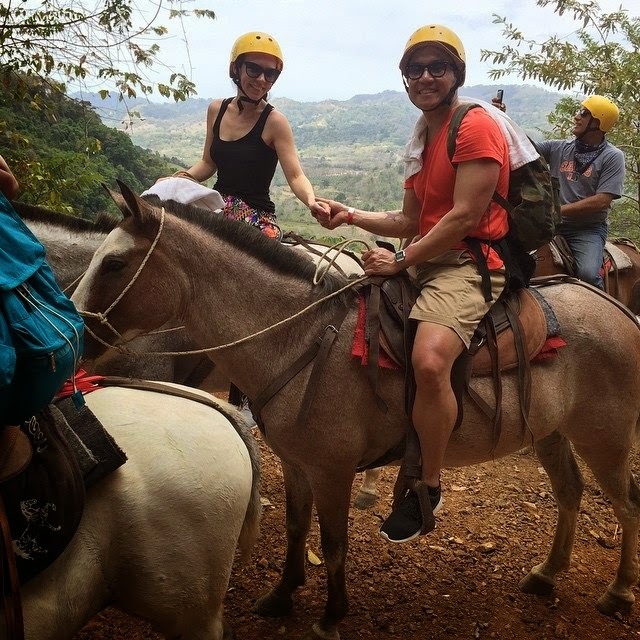 When I heard horseback riding, I figured it would be a leisurely stroll into the jungle followed by a relaxing swim. Little did I know the trails to get to the waterfall were incredibly steep and just to hang out on the horse while they walked this terrain was so tiring (and I felt even worse for the poor horse). There are definitely some parts of the path that had my jaw drop because they seemed almost like a sheer drop down or incline up, but these horses were so skilled at navigating the terrain which was amazing. Once we reached the waterfall, there was another 300 steps to walk down to get there, which doesn't seem bad until you have to go back up. Lol. 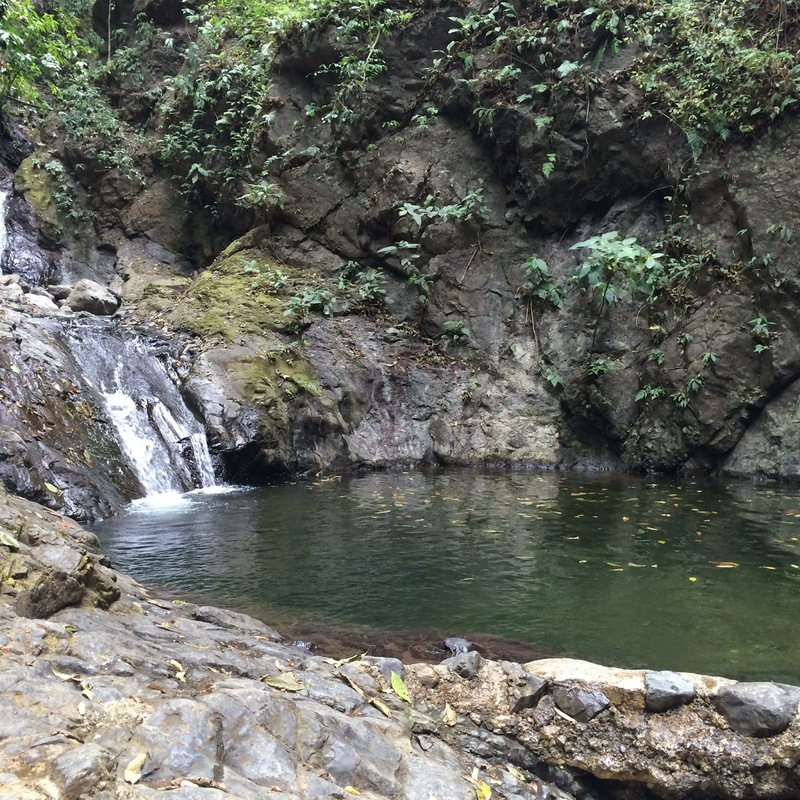 The waterfall and natural pool were stunning and refreshing and they let you swim for about an hour or so. It felt so incredible and was something I won't ever forget. 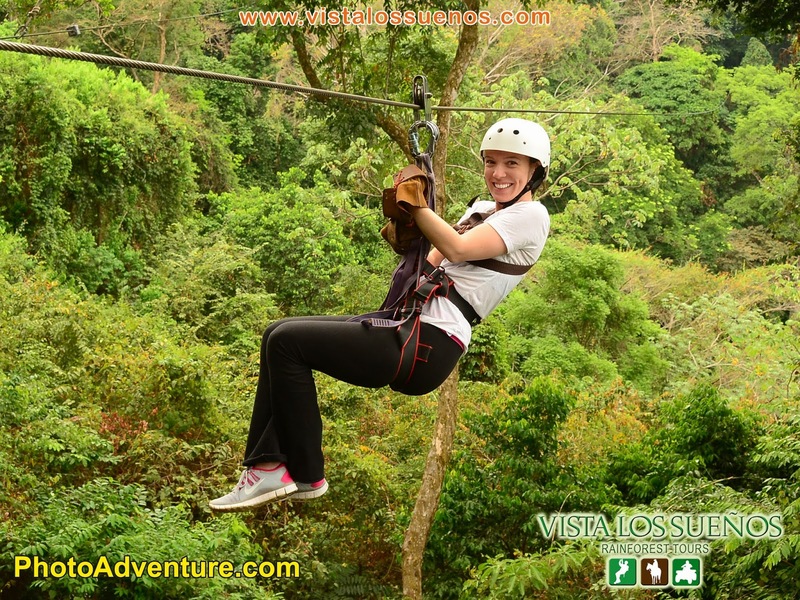 Vista Los Suenos Zip Line Canopy Tour - Ok, before I talk about this last activity, let me preface it by saying that I have an intense fear of heights. Almost paralyzing some may say - and the people that were on the tour with me would probably say that. Lol. But you may ask why I participated in zip lining if I have this fear - and I don't really have an answer other than I don't want to let my fear hold me back. I wanted to experience this, and even though it was terrifying, I am happy I did it - and that my husband and I could do it together. As you can see from the above pictures, Stan clearly does not have a fear of heights and is quite the daredevil. The course is comprised of 12 zip lines that take you through the jungle and it last about 2 hours. There are instructors at every single platform to help clip you in, which was really comforting to me. The view and zipline ride itself was awe-inspiring - it was just the waiting on the platform hundreds of feet off the ground that had me freeze in terror. And by freeze I literally mean I was scooting around the tree hugging it for dear life while sobbing like a baby. Every. Single. Time. I sobbed through the whole course - which was hysterical for the 5 and 7 years old that were in my group ziplining like pros. Ha! Despite my fear, it was a super professional team that worked with us, a fun course and views that were like no other. I would probably do it again since I now know what to expect, but I'll still cry. And I'm ok with that. 2. Choose a big tote that you will use while on your trip to be your carry on. My beach bag was my carry on in this case and it was absolutely perfect. 3. Bring tons of clutches/cross-body bags - and then pack them all inside one another. They are easy to interchange with different outfits but don't take up a lot of room. I save my over-the-shoulder bags/satchels/etc for home - itty bitty cross bodies and clutches are my go-tos for vacation. 4. Use one of those clutches to carry most of your personal/important stuff. While I understand the need to "not put your eggs in one basket" so to speak, I found that keeping the money, passports, boarding passes, travel paperwork/notes/hotel info all in one clutch that I can easily grab in a moment's notice was so handy. Searching for all these things in different bags is a waste of time. But that being said, I did keep some money with my husband and some in another secret compartment of my suitcase (along with an extra credit card) so that just in case the clutch was lost, we can still function. 5. This mini steamer saved my life. No ironing needed and no wrinkled clothes. Seriously - this will save your life....and your wardrobe while traveling. 6. Bring allergy medicine for places that have tons of bugs. Ok, I got this tip from an allergy doctor years ago when I told her that I ALWAYS am prone to bug bites wherever I go. And being in the middle of the jungle, I was terrified I would be covered...and thus get quite sick. But I took an allergy pill every morning and I did not get bit once! I don't think the allergy meds keep the bugs away like a bug spray, but I do think that they help my body not react if I do get bit. It was the first vacation ever that my husband and I did not have a single bite between the two of us. Yay! 7. Flight 001 spacepak system - I had heard about the Flight 001 packing system, but never believed it would help. Boy was I wrong. I fit my entire week's worth of clothing in that blue pack, leaving so much more room in my suitcase. I only picked up the toiletry pack and the clothing pack, but I plan to go back and buy all of the spacepak bags because it helps separate and color code your contents and keep everything organized. This changed my entire packing life - bring on the next vacation! 8. Currency - This is just for those thinking about traveling to Costa Rica - the US dollar is widely accepted and we got away without having to exchange our currency. Here and there we were given change in colones (Costa Rican currency), but mostly it was all in dollars. 9. Skincare - hoard all your samples from your Sephora and Nordstrom purchases and only bring those on your trip. This way you will go with a full bag, use up all the samples and lighten your load on the way back. The only thing that did not fall in this line of thinking was my sunscreens. Those were all full sized because my poor pale self needed as much as possible. I hope you found this post helpful with tips that you can apply towards your next trip! My husband and I had such a wonderful time and are already beginning to save for our next adventure. As the old saying goes, "traveling is the only thing you buy that makes you richer". I'm going on my first cruise in July and am freaking out about how to pack for a week with only a carry on so I'm glad to hear about Flight 001. I bought the blue pack to see who much I can pack into it. Thanks for the tips! Thanks so much for sharing these brilliant tips Maree! Your holiday looked fantastic and I’m now so excited for my trip in December - you’ve given me a lot of excursion inspiration!